Any pet or person who is in snake habitat is a potential bite victim; snake bites that transmit venom are dangerous for many creatures. Venomous snakes are present in early all contiguous United States with rattlesnakes being the most prevalent species to cause envenomation, or venom injection. Venom is a toxin and venomous bites can be deadly without appropriate immediate emergency care. As with most toxins, the concentration of the toxin, the size of the pet, and the amount of toxin consumed or infused are all variables in the patient’s outcome and survival. Both the location of the bite and the lag time from bite wound to emergency care impact treatment and prognosis. Rattlesnake venom is a potent thick concoction of enzymes and proteins that induce severe, painful, disfiguring, and sometimes lethal consequences in prey. Venom is utilized by rattlesnakes as a defense mechanism or to immobilize or digest prey. Venom, depending on the toxin makeup, typically affects either the nervous system or the hematologic (blood) system, and sometimes a combination of both. Rattlesnake venom primarily affects blood and circulation. Symptoms related to envenomation can include uncontrolled hemorrhage, bruising and skin discoloration, severe tissue swelling and tissue death, and collapse or weakness from severe fluid loss. Venom containing neurotoxins can cause paralysis, seizures, and respiratory failure. Symptoms may begin to develop shortly after the bite, but may take several hours to days to reveal the full extent and consequences of the injury. “I saw the bite!” transport to the ER. Do not wait for symptoms to develop. No effective in the field treatment exists- attempts to treat snake bites in the field delays appropriate interventions by a veterinary team. *Note* It is ok to flush the wound with saline;do not scrub or irritate the wound. Sudden lameness or swelling in pet’s face or leg: Seek emergency care. Snake bite wounds occur most commonly on the face and legs of pets. It’s impossible to determine by appearance alone if venom was injected, or if the was a “dry” bite (about 20% of rattlesnake bites are dry and do not lead to envenomation). *Note* Examination of the wound may require the clinical team to clip your pet’s hair. Keep the wound below the level of the pet’s heart if possible. Keep your pet calm and restrict activity. Increased stress or activity can increase blood flow and may facilitate more rapid spread and absorption of toxins. Do not use turniques or ice on bites, this may cause more severe local tissue reactions. Do not administer pain medication as some medications can cause bleeding irregularities. Remove the threat: Get your pet away from the snake. Do not let pets eat the snake or be repeatedly bitten; even dead snakes can release venom. Become familiar with the kinds of snakes in your area or areas you will visit. if you see the snake that bit your pet and can identify it- this can help direct treatment (take a picture of the snake if this can be done from a safe distance). Allow the emergency veterinary clinic to locate available antivenin (if appropriate). Antivenin infusion is time-sensitive. Expect hospitalization for your pet for 1 to several days. This allows close monitoring, IV fluids, and ability to treat/manage the pet as symptoms develop. Treatment for snake bites is largely supportive care. What About the Rattlesnake Vaccine? 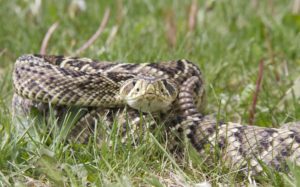 Rattlesnake vaccine is not a “core” vaccine and many vet clinics do not routinely carry or recommend as a regular course of care. To date, little published data is available on the efficacy of rattlesnake vaccines;that being said, there is minimal evidence of drawbacks to the vaccine. It’s use may be recommended for pets at high risk of rattlesnake bite. Scientists theorize that rattlesnake vaccine primes the immune system to enable partial immobilization of venom if a pet becomes bitten. The vaccine does not prevent the need for emergency care after a bite wound but may be helpful when necessary to travel long distances for vet care. 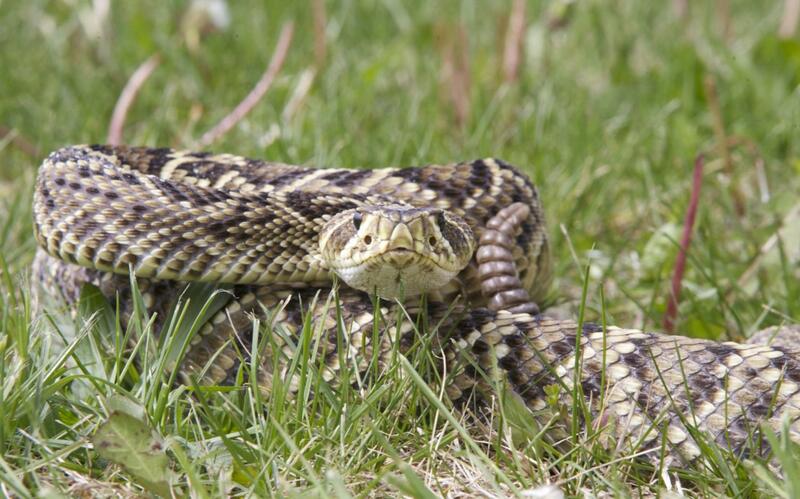 The vaccine is a toxoid product and requires a booster every 6-12 months.Early spring vaccination is recommended, as primary bite season for rattlesnakes is early spring to late fall; this recommendation may vary based on geographic location (seasonality of snake bite is based somewhat on temperature). In warm weather, snakes tend to prefer late evening and night to hunt.Keep your pets in snake-proof housing at night and on leashes if they are accompanying you outdoors. Keep rodents away, as snakes tend to congregate where they will locate a prefered food source. Avoid long prairie grass, stacks of wood or old logs – while this is tricky with hunting dogs, it’s still a good guideline to follow when possible. Well-groomed, open lawns/yards are less snake friendly, as snakes prefer camouflaged natural habitats. Train pets to recall on command or utilize a training collar to redirect when a dog is investigating a potential danger. Dogs can even be trained to alert when a snake is seen. Look and listen to surroundings. Do not investigate suspicious sounds. Many snakes will rattle to warn predators prior to striking. Avoidance of rattlesnake interactions is best when possible. Mud River is proud to share these tips from Dr. B with our customers. Keep in mind it is best to work with your local veterinarian to determine the needs for your animals. Help! Where Did Brownie’s Teeth Go?